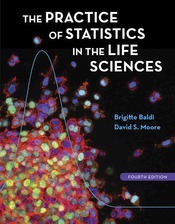 The Practice of Statistics in the Life Sciences gives biology students an introduction to statistical practice all their own. It covers essential statistical topics with examples and exercises drawn from across the life sciences, including the fields of nursing, public health, and allied health. Based on David Moore’s The Basic Practice of Statistics, PSLS mirrors that #1 bestseller’s signature emphasis on statistical thinking, real data, and what statisticians actually do.